When I've read about investing and considered the services of investment advisory firms, I've often encountered the term of asset allocation. 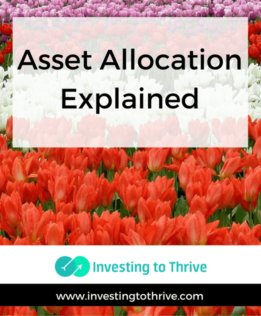 What is asset allocation? A simple definition: it's putting my proverbial eggs in multiple, uncorrelated baskets. For an investor, this process involves allocating investments among the big three types of asset classes: equities, fixed income instruments, and cash and its equivalents. Equities can come in the form of individual stocks or baskets of stocks as found in mutual funds and exchange-traded funds (ETFs). Fixed-income investments are those designed to generate a fixed amount over a certain amount of time, such as individual bonds, bond mutual funds, fixed-income ETFs, certificates of deposit, and money market funds. And, cash is money held in FDIC-insured checking and savings accounts. The Securities and Exchange Commission (SEC) mentions that there are other asset classes or categories, such as real estate, precious metals and other commodities, and private equity. When I reference “uncorrelated” investments, I am drawing attention to the idea that assets within different classes typically grow in value at different rates and according to different timelines. Simplistically, historically, for example, when stock returns go up, bond values may fall; when interest rates on cash are high, stock returns may falter. Drawing upon this idea, experts recommend that a portfolio should contain a proper allocation of asset classes. The reason for keeping a mix of investments is that the value of holdings in each asset class as a whole will be more consistent, even as each asset class fluctuates. There's a potential downside to applying asset allocation, particularly for someone like me who prefers stocks. If I hold more bonds to achieve proper asset allocation, I'll miss out on some investment growth when stocks are soaring. But (to the point of the asset allocation proponents), I may miss losses and volatility often associated with stocks when some of my money is held in bonds, cash, and real estate. By using asset allocation in designing a portfolio, I may be able to manage wild movement in my combined holdings while still experiencing increase in its value. Notably, as I get older (and closer to retirement or a specific financial goal), a generally recommended allocation begins to shift away from stocks toward more stable and safer investments such as bonds or cash. Such an allocation makes sense if I'm planning on withdrawing money soon, so I don't have to sell stocks when they are priced low (possibly) just to generate cash to buy groceries. Sometimes, asset allocation is used interchangeably with diversification. But they have different meanings. Looking again at an explanation by the SEC, “A diversified portfolio should be diversified at two levels: between asset categories and within asset categories.” That is, diversification can be (partially) achieved through asset allocation but the two are not exactly the same thing. At a practical level, I may need to choose an asset allocation based on my time horizon for my financial goals and risk tolerance, and then diversify my investments within these main categories. The stock segment of my portfolio might be divided up among 15-20 stocks or among a handful of index funds representing domestic and international, large-cap and small-cap, growth and value equities, for example. Similarly, my real estate holdings might include rental properties and a real estate investment trust (REIT) mutual fund. Again, the idea for diversification is to spread out the risk of failure plus hold investments that are not correlated so I'll avoid overly wild rides in terms of portfolio fluctuations. The concept of asset allocation is based on Nobel Prize winning portfolio theory developed by Harry Markowitz. The idea is that investors should put their money into distinct categories (or asset classes) that behave differently, so together, they can deliver optimal returns at certain levels of acceptable risk. Since that time, this work, typically referenced as Modern Portfolio Theory (MPT) has served as a foundation for the design of investment products, services, and managed portfolios.